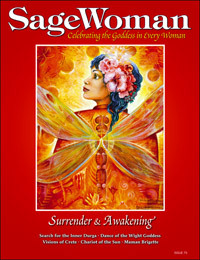 SageWoman #75 Surrender & Awakening (paper) [sw075p] - $7.95 : BBI Media - Magazines that feed your soul. In this issue, we delve into those times when we are overwhelmed — by events, by emotions, by fate — and find ourselves unable to keep actively fighting. When we release control, we allow the transpersonal (the Goddess, if you will) to take over. What happens then? In "Dance of the Wight Goddess" Maria Ede-Weaving visits the crumbling cliffs of the Isle of Wight in search of healing from years family pain and strife; while Tess Dawson dream-journeys the Canaanite Goddess Lady Shapsu in "Chariot of the Sun" and Melodie Bolt finds herself reliving her experience as an ancient priestess in "Visions of Crete." Jerda Smeltzer calls on Durga when she is caught in a (literal) undertow in "Search for the Inner Durga"), Gretchen Treadwell journeys deep into the abyss (and back) in "The Descent" and Dina Peace must find her way after a relationship ends in "Hexagram 58: The Joyous." Goddess loremistress Diana Paxson leads us to the land of the ultimate surrender: the realm of Maman Brigitte, the Haitian Lady of the Dead. There's far more to this Goddess than graveyards and skeletons! We are pleased to report that Grandmother Witch herself, Z Budapest, joins SageWoman in this issue with a new regular column on spirituality and politics "Generation Z", while our regular columnists continue to delve into Goddess-spirit on topics ranging from teaching your children to honor the ancestors to the sovereignty and dignity of becoming a Queen Mum yourself. There's also a double-handful of book and product reviews, and the bubbling cauldron that is the Rattle. All-in-all, an autumnal cornucopia of Goddess plenty, just in time for Samhain and the early winter season. 96 illustrated pages, edited by Anne Newkirk Niven, released in September 2008.